Neale Duffett is a lifelong resident of Portland, Maine. He is a graduate of Deering High School, Dartmouth College in Hanover NH, and the University of Maine School of Law. In 1987, Neale joined the firm of Cloutier, Conley & Duffett, P.A. where he specializes in criminal defense law in all state and federal courts. A well-respected member of the Maine Bar, Neale has extensive courtroom trial and litigation experience in all classes of offenses, including all felonies and misdemeanors, drug offenses, crimes of violence and murder. Neale is a U.S. Navy veteran and serves on the State of Maine Parole Board and as the past Chair of the State of Maine Board of Corrections. 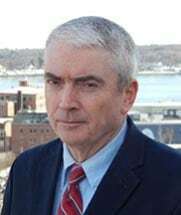 He is a Past President of the Maine Association of Criminal Defense Lawyers, a Board Member of the New England Association of Drug Court Professionals, and is Co-Chair of the Maine Rule of Law Partnership with the Archangel Region in Russia. He is married and he and his wife Deborah live in Portland.